TELANGANA STATE LEVEL POLICE RECRUITMENT BOARD (TSLPRB) issued notifications for the recruitment of SCT Sub-Inspectors of Police (Civil/AR/SAR/TSSP/SPF/SFO); SCT Sub-Inspectors of Police (Communication/PTO) on 06-02-2016 in Police department. Preliminary Written Test, Physical Measurements Test and Physical Efficiency Test (PET) for the above recruitment's have been completed. All the candidates qualified in PET have to appear for Final Written Examination. 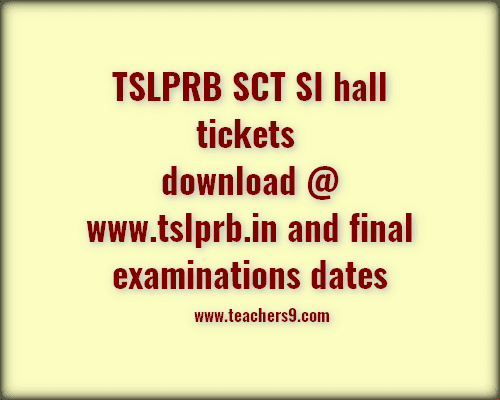 The candidates may download the Hall Tickets one week before the date of examination.